The Shingwauk Anishinaabe Students’ Association (SASA) is committed to ensuring that Anishinaabe (First Nations, Inuit, and Métis) students’ university experience is fulfilling and enjoyable. 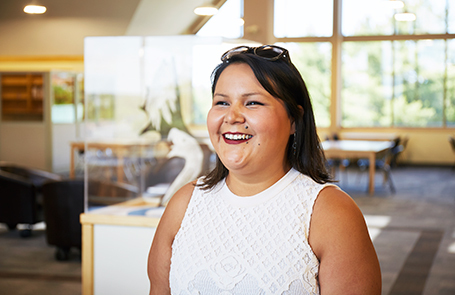 SASA is an organization run by students for students, and works to ensure that Anishinaabe students’ voices are recognized amongst the Algoma U community. SASA supports the academic and cultural needs of Anishinaabe students and offers family and cultural activities for all students in the Algoma U community. To represent Anishinaabe students on various Algoma University boards and committees in order to inform and ensure that Anishinaabe student needs and aspirations are expressed and promoted. Anishinaabe students of Algoma University are members of the Shingwauk Anishinaabe Students’ Association (SASA), and are represented on Algoma University Students’ Union (AUSU), the Anishinaabe People’s Council (an advisory committee of the University’s Board of Governors), and the Cross-Cultural Committee. For more information, or to get involved, please contact SASA by email at sasa@algomau.ca. Stay up to date with the Shingwauk Anishinaabe Students’ Association by following them on Facebook.